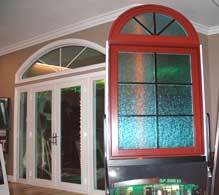 Windows for houses, Replacement retrofit vinyl, fiberglass, wood. "This is my favorite window!" With fiberglass exterior finish. Double glazed. Windows in Million dollar homes; jobs we've done. How to install a replacement window; step by step. Technical reading, Low-e, vinyl vs fiberglass, facts. Catalogs and links to Milgard, Jeld-wen, and more. Copyright 2015 by D.P. Door Company. All rights reserved. Milgard,Milgard Essence, Milgard Tuscany & Style Line Windows, Anderson, Jeld-Wen, Marvin, EPA, BBB, Chamber of Commerce (Claremont & Rancho Cucamonga),UHS, CSLB, Energy Upgrade Ca., AAMA, So Cal Edison & Gas Co. are trademarks of those entities.